Here's how to see how much space your Pro Managed WordPress site uses. Note: Pro accounts are available only in the United States and Canada. To view site usage for Managed WordPress sites on a Basic, Deluxe, Ultimate, or Developer plan, see Check my disk space usage. For the site you want to view, click the three-dot icon and select Settings. In the Usage section, click Site. 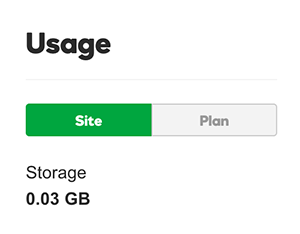 Note: To see how much space all the sites on your plan are using, click Plan. 1/0 Usage and Phys Memory Usage Maxed - Why? ManageWP Dashboard sees my Clients but not their websites?